The Units command displays a dialog which shows information about the units of measurement that are currently being used by GIMP. It also allows you to create new units which can be used by GIMP in a variety of situations. You can access this command from the image menubar through Edit → Units. 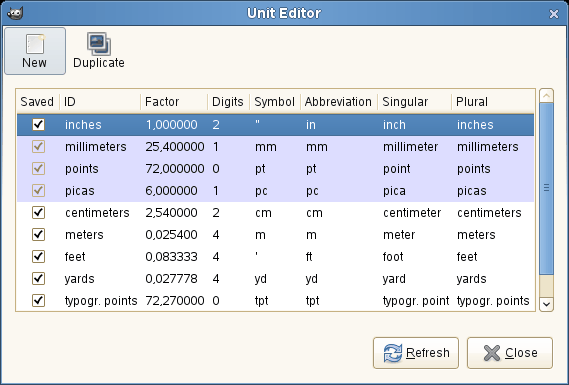 The figure above shows the “Unit Editor” dialog window. The list shows the units of measurement which are currently defined. You can click on the New button or the Duplicate button to create a new measurement unit, as described below. Saved: If this column is checked, a unit definition will be saved when GIMP exits. Some units are always kept, even if they are not marked with a check. These are highlighted in the list. ID: The string GIMP uses to identify the unit in its configuration files. Factor: How many units make up an inch. Digits: This field is a hint for numerical input fields. It specifies how many decimal digits the input field should provide to get approximately the same accuracy as an “inch” input field with two decimal digits. Symbol: The unit's symbol if it has one (e.g. " for inches). The unit's abbreviation is used if doesn't have a symbol. Abbreviation: The unit's abbreviation (e.g. “cm” for centimeters). Singular: The unit's singular form, which GIMP can use to display messages about the unit. Plural: The unit's plural form, which GIMP can use to display messages about the unit. You can display the dialog shown above by clicking on either the New button or the Duplicate button on the Unit Editor dialog. 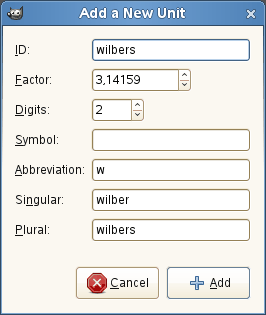 The input fields on the dialog are described above. If you click on the New button, most input fields are empty. If you click on the Duplicate button, the values initially displayed in the input fields of the dialog are the values of the unit you have currently selected in the Unit Editor dialog. You can then edit the values to create your new unit.